DUMBARTON warmed their travelling support with a fine victory over Cowdenbeath at icy Central Park. DUMBARTON warmed their travelling support with a fine victory over Cowdenbeath at icy Central Park in front of a total crowd of 460. It took three inspections of the far side of the pitch before referee Matt Northcroft signalled that the match could go ahead. Before the kick-off a one minute silence was observed for a Cowdenbeath director, Stewart Juner, who died a few days earlier at the age of 42. The match had a red hot start, with Kyle Miller opening the scoring for the Blue Brazil, then Colin Nish equalising in a goalmouth melee moments later. Midway through the half Sons striker Mitch Megginson brushed off a foul on the edge of the box and his home no.2, a great solo goal. But then the talented Jamie Stevenson equalised, making the half-time score 2-2. Dumbarton dominated much of the second period, with on loan St Johnstone striker Chris Kane making it 3-2. The home side fought back and there was some frantic defending from the Sons rearguard. But on 83 minutes Megginson made sure of the points when he hit home his second goal of the afternoon. 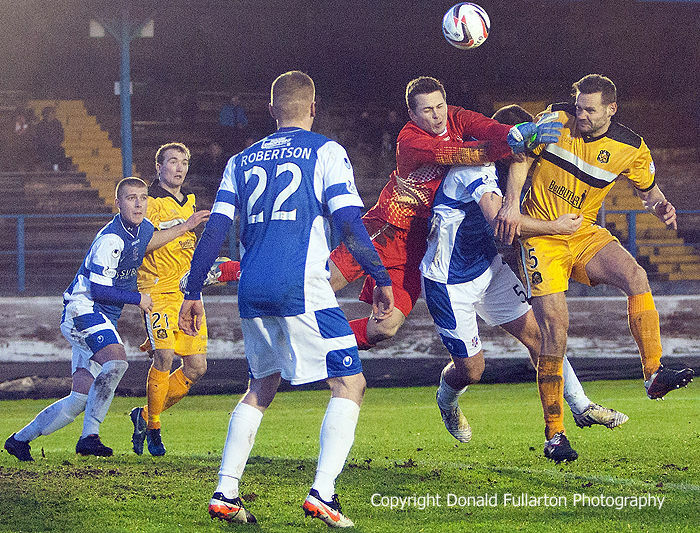 The result put Sons nine points ahead of Cowden and 17 ahead of bottom-placed Morton, and they are in seventh place. The picture shows defender Mark McLaughlin heading for goal.